Welcome to the Grand Canyon National Park Information Page. The closest airport is Flagstaff, located about 80 miles southeast of the park. Other airports are Las Vegas, Phoenix and Grand Canyon Airport in Tusayan, just south of the park. 1. To the North Rim. Take Highway 89 South to ALT 89 South to Jacob Lake, Arizona then take Stateroad 67 South to the North Rim. 2. To the South Rim. Take Highway 89 South to just past Cameron, Arizona and take Stateroad 64 West to the Park. 1. To the South Rim. Take I-17 North to Flagstaff, Arizona and then take Highway 89 North to just before Cameron and take Stateroad 64 West to the Park. 2. To the North Rim. Take 1-17 North to Flagstaff, Arizona and then take Highway 89 North to ALT 89 North to Marble Canyon, take ALT 89 to Jacob Lake, Arizona then take Stateroad 67 South to the North Rim. 1. Take I-40 West to Flagstaff, Arizona and follow the directions From the South to the South or North Rims. 2. Take Highway 160 West to Highway 89 and for the North Rim, go North on 89 to ALT 89 North to Marble Canyon, take ALT 89 to Jacob Lake, Arizona then take Stateroad 67 South to the North Rim; for the South Rim, go South on 89 to just past Cameron, Arizona and take Stateroad 64 West to the Park. 3. Take I-10 West to I-17 North to Flagstaff, Arizona and then take Highway 89 North to just before Cameron and take Stateroad 64 West to the Park (South Rim). For North Rim directions, follow number 2 in From the South. 1. Head for Highway 89 South and follow the directions in getting there From the North. 2. Take I-40 East to Stateroad 64 North to Highway 180 North to the Park. 3. Take I-10 East to I-17 North or I-8 East to I-10 North to I-17 North to Flagstaff, Arizona and follow the directions for the South or North Rim in From the South. Hiking in Grand Canyon National Park can be a fun and rewarding experience as in other national parks. It is a great way to both see and experience the park. In 2000 Grand Canyon National Park received 30,000 requests for backcountry permits. The park issued 13,000 permits, and close to 40,000 people camped overnight in the backcountry at Grand Canyon. The majority of these people are here for the first time, and although many are avid hikers, they find that hiking the Grand Canyon is very different from most other backpacking experiences. They tend to react to the experience in one of two ways: either they can’t wait to get back, or they swear they’ll never do it again. Depending upon how prepared you are and what the canyon serves up at any particular time, your trip can be a vacation or a challenge, a revelation or an ordeal. You will be hiking in a desert climate, where water and protection from the elements make the difference between life and death. Your trip begins at a high elevation (7,000 – 8,000 feet), and requires a bone jarring descent at the beginning of your trip, when your pack is heaviest. You’ll face the long climb out when you are already tired. Grand Canyon National Park encompasses more than 1.2 million acres, the vast majority of which are inaccessible due to the predominance of cliffs and inhospitable to all but plants and animals able to survive in the desert. The Colorado River bisects the canyon; hikers can cross the river only at Phantom Ranch. If you choose to hike from rim to river to rim, you will have to deal with an elevation differential of more than 10,000 feet from start to finish. Most visitors begin and end their hikes from the South Rim. Grand Canyon is heavily visited for most of the year and it is imperative to plan ahead for lodging, backcountry permits, or mule trips. Persons planning day visits only should arrive early in the day as parking is limited. Write the park in advance to request a Trip Planner (or Backcountry Trip Planner if you are planning to backpack). Grand Canyon National Park is in a remote part of the country. Here are a few tips. Bring an extra set of car keys – it could be a long wait for a locksmith. Film is available at both rims, but the closest camera repair is in Flagstaff, Williams or Page, Arizona. Distances are deceiving in this part of the country: it may look like you can visit three parks in one day, but the reality is often different. Bicycles are not available for rent at the park. If you plan to bring one, remember that in Arizona bicycles are subject to the same traffic rules as automobiles. Use extreme caution when riding on park roads; shoulders are narrow and vehicle traffic is heavy. The West Rim Drive is open to bicycles throughout the year, but remember that during the summer months there is heavy bus traffic on the West Rim Drive. Use caution and do not obstruct traffic. Bicycles are not allowed on any park trails. Mountain bikes are allowed only on those roads open to automobile traffic. 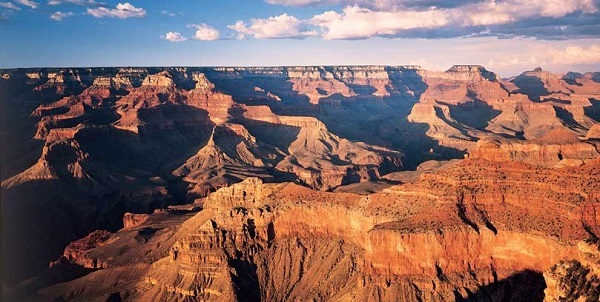 Persons wishing to take a guided bus tour may make arrangements to do so through Grand Canyon National Park Lodges. Reservations are required from April through November. For online reservations, visit http://reservations.nps.gov or call Biospherics at: 800-365-2267; outside the U.S. call: 301-722-1257. Camping in the park on the South Rim is generally restricted to established campgrounds, although a few remote sites are available with a Backcountry permit. There are three established campgrounds on the South Rim; Mather Campground, Trailer Village, Desert View Campground. North Rim has one established campground. North Rim Campground (no hook-ups) in the park a mile from the rim. See the Camping Page for more information. Fishing in the park requires an Arizona State fishing license. Licenses are available at Canyon Village Marketplace in Grand Canyon Village on the South Rim. Call: 928-638-2234 or 928-638-2262. Licenses are also available at Marble Canyon Lodge, located 2.5 hours north from the South Rim, near Lees Ferry. Licenses are not available at the North Rim. Make sure you know the regulations before you fish. Most fishing opportunities require an overnight backcountry use permit. Groceries and supplies are available on the South Rim at Babbitt’s General Store (both in Grand Canyon Village and at Desert View). There is a small camper store on the North Rim, adjacent to the North Rim Campground. Weather is particularly changeable in spring and fall; visitors should be prepared for a variety of climates. See the Weather Page for current conditions, forecasts and other weather data.